On July 9, 1877, the All England Lawn and Tennis Club of Wimbledon, London, began its first championship tournament. Australian player Lleyton Hewitt and Serbian player Novak Djokovic face off on Court One in the fourth round of the 2010 Wimbledon Championships. Djokovic won the match, although he ultimately fell to Czech player Tomas Berdych . . . who lost to Spanish player Rafael Nadal in the final. Photograph by Marc Di Luzio, courtesy Wikimedia. This file is licensed under the Creative Commons Attribution 2.0 Generic license. On July 9, 1877, the All England Lawn Tennis and Croquet Club (AELTC) began its first championship tournament. The home of the AELTC is the London suburb of Wimbledon, and the competition quickly assumed the suburb’s name. Today, Wimbledon is the most prestigious tennis tournament in the world. The first Wimbledon Championship had only one competition, a men’s singles event. It was won by British athlete Spencer Gore. 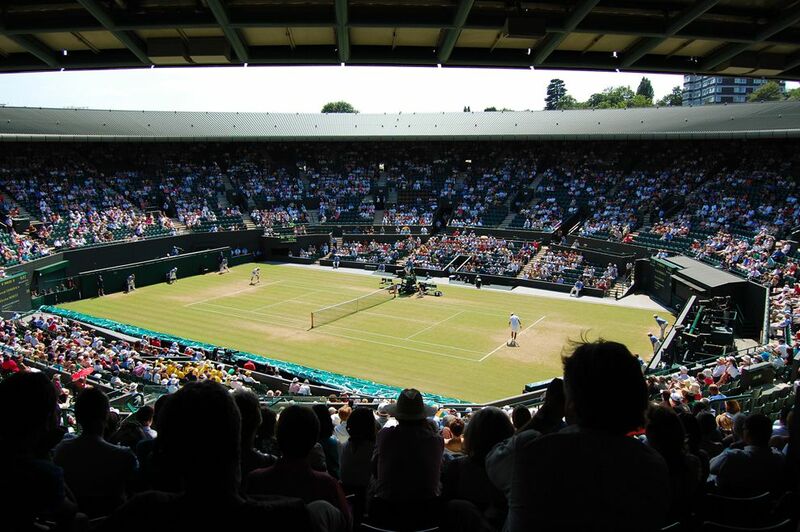 Today, Wimbledon has five main events: men’s singles and doubles; women’s singles and doubles; and mixed doubles, which features teams of men and women. The athletes with the most Wimbledon titles (singles, doubles, and mixed doubles) are both women—Czech-American player Martina Navratilova and American player Billie Jean King, each with 20 titles. to take on a quality associated with something else. type of sedimentary rock that is able to be shaped when wet.